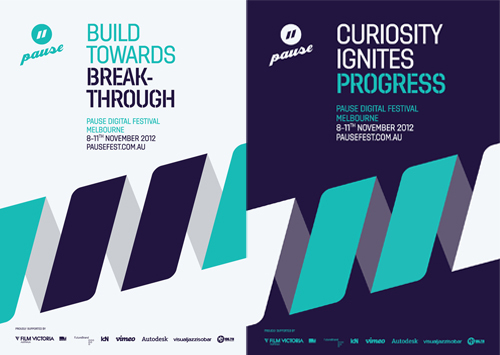 Melbourne, VIC, September 2012, - Pause Digital Festival Melbourne 2012 has just announced the festival program and the release of early bird tickets! Skip the queue and make sure you don’t miss out on all the festival highlights. This year Pause is offering special Full Screening Passes – giving you access to 11 paid screenings at a fraction of the price. Or ride the wave and get the best seats with a Full Festival VIP Pass, ensuring you entry to all PauseScreen events and the premiere conference event PauseStage. We are also excited to announce that TYP3D will be curating two screenings at PauseScreen on the November Saturday 10th. TYP3D is teaming up Huds + Guis blog to present Fictional User Interfaces in Film, and ; Forget the Film Watch the Tiles – a retrospective of the best title sequences from 2005-2010. For more information find here in the program. PauseStage is an exclusive one-day event aimed as professional development for the creative industries in a moderated Q&A session by Mark Simpson from Sydney’s Sixty40 studio. Speakers will include Alexandra Sundqvist (Hyper Island/Stockholm, Brisbane), Jason White (Leviathan/Chicago), Christian Fritz (Marmalade/ Hamburg), Rick Chen (Pozible), David Chontos & Kim Wildenburg (Psyop/ LA, Sydney), Jeremy Boxer (Vimeo/NYC,London) and Katie Mackin (XYZ Studios). This special event will be followed by PausePanel, where the speakers will discuss the future of the digital industries. PauseScreen encompasses 14 exciting screenings (Including TYP3Ds screenings) on the festival’s theme: FUTURE. Everything from animated short films; animated ads; futuristic short films and motion graphics to special screenings such as PauseED – a showcase of student and graduate work; specially created Pause Ident animations, or the video resumes from some of the world’s best studios that make up PauseCribs, this year’s festival is jam-packed with digital delights! The Best of ViewFest from Italy, and Lovesong, a highly acclaimed piece of theatre filmed in breathtaking HD by Digital Theatre London. PausePlayground – a series of workshops from some of the leaders of the digital industries, including ARUP, Iloura, MediaLab Melbourne, Visual Jazz Isobar, Hyper Island and PauseView – 8 exciting and interactive installations including: Snake the Planet, an interactive projections mapping gaming experience and the SoundCloud Sound Mapping project, putting Melbourne on the map! Only a limited number of tickets will be released at early bird prices for Full Festival VIP Passes and Full Screening Passes so don’t miss out! In 2012 Pause Fest will run November 8-11. For the full festival program, ticket prices and how to buy tickets head to: http://bit.ly/TzwC1Y . Buy ticket's to FUI in Film here. Buy tickets to Forget the film, Watch the titles here.